Sorry I've been bad about commenting. I have been out of town. You mentioned many of my very favorite Vietmanese dishes. Guess we're going to Argyle street (In Chicago. Full of Vietnamese restaurants) this weekend. I like pho, but I only ever order it after I've been to a place several times. It's the same with bulgogi and Korean restaurants. I don't want anyone thinking "of course the white girl ordered that." I have to eat here. that looks great! Excellent. Another selection close to my office. I'll definitely try it out soon. You are killing me! 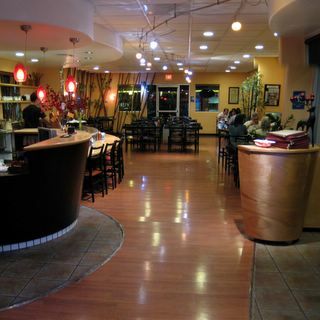 My son and I just went out for pho last night oer by the 99 Ranch Market on Jeffrey & 5 fwy. He loved it, I thought it lacked. We're lucky to have soo much culturaly diverse foods available....now we can actually tell what's good! Have to chime in here. You were right, the pho at Pho Irvine is lacking. I should probably post my review of it at some point. Try Pho Bac Ky on Barranca. It's about the best you'll get in Irvine. On the flip side, there are now FOUR pho places in Irvine. When I moved here there weren't any at all. Isn't diversity grand? Funny enough I have the opposite problem. When I go to a Korean tofu restaurant, I always order the tofu soup "white", which I'm pretty sure makes the servers do a double-take since I've been told I look like a Korean. It's becoming mine too! 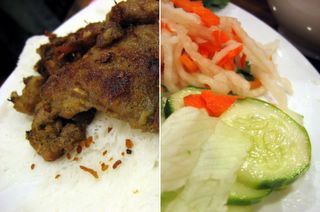 Quan Hy, the bigger sister to this family of restaurants purportedly serves even more exotic eats. I'm so there. You know what?! I didn't even realize it until you pointed it out! You're right! It is a pretty expensive bowl of pho. I guess that's how they recover the cost of the filet mignon. Funny though, I'm usually pretty price sensitive. But I guess the other dishes distracted me from the sticker price of the pho. I think you'll like it. Pretty clean and modern surroundings too. I tried Pho 99 exactly once, and although I didn't find it objectionable, I'm a frequent customer of Pho Bac Ky (the one on Barranca)...if for no other reason than I'm a creature of habit. Plus, they have this dessert called "The Black Sea" that is just about the best icy mixed drink/dessert ever!!! Whoops. You're right. I totally mixed up the restaurant names there. Pho 99 is the one on Walnut that I was thinking about, and Pho Bac is the one on Barranca, not Pho Bac Ky.
... Which means that there are now so many pho places in Irvine I'm able to get them confused! I don't even know when was the last time I had pho! We would have it on a weekly basis in Hawaii - but man, I need to take more advantage of LA while I'm here :) Awesome post! That's the first time I've seen a Vietnamese restaurant give our free sweets at the end! I was surprised when they gave us that treat to end our meal. But the next visit (a week after), they had no such giveaways. I think they may have run out. wtf they didn't offer us fried sesame seed balls when we ate there (~2 weeks ago)... and we ordered a ton of stuff. Man, I thought I know every restaurant in Little Saigon but I have not been here yet. Maybe , this weekend. Some guy name Kirk said that he will meet me and you in October for VN food and here it is 6 days remove from Haloween and I have not heard from either one of you. You two are too good for me or WHAT? LOL. Yeah, it must have been just that one night. Probably because they just happen to have an excess supply of those sesame balls. Weird. I was expecting to get more on the last trip too, but nope...got bupkis! Well, I, for one, am still up for 7 course of beef. I'm going to e-mail you offline to schedule. Wow! 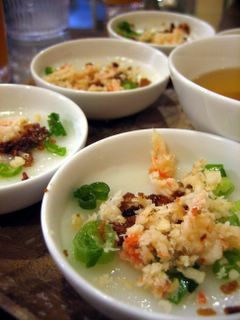 I've never seen individual saucers of banh beo before. I need to go check this place out for myself. I wonder if you can tell me if this is the traditional way it is served. 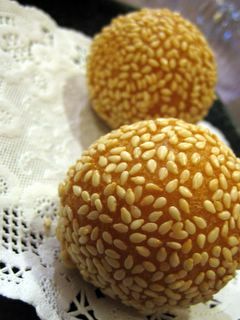 It is a traditional way to serve " Banh Beo" in individual plate. They do the same thing in VN. You can order the same thing at Rendezvous at the corner of Mc Fadden and Brookhurst. What this restaurant serve is NOT necessary new but maybe different in taste. Hmmm I'm not sure if it is the traditional way or not. The way that I've always had it is a whole bunch of banh beo would be piled on a plated. Kind of like family style and you would just take whatever amount you like. Then pour fish sauce over it. Darn it! I had typed out a whole msg and then when I signed on the beta version deleted everything. It's been a while but I was remembering Quan Hy's banh beo as slightly less than $5? 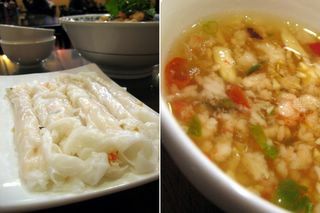 Try the bun mit (green jackfruit noodles). The jackfruit isn't yellow but actually rather fleshy colored? I dunno if it's new to you but it was definitely something I hadn't had anywhere else. Last summer in my hometown in south-central Vietnam, I had banh beo in batches of 10 for 20 cents. I could treat my whole family for only a few dollars. 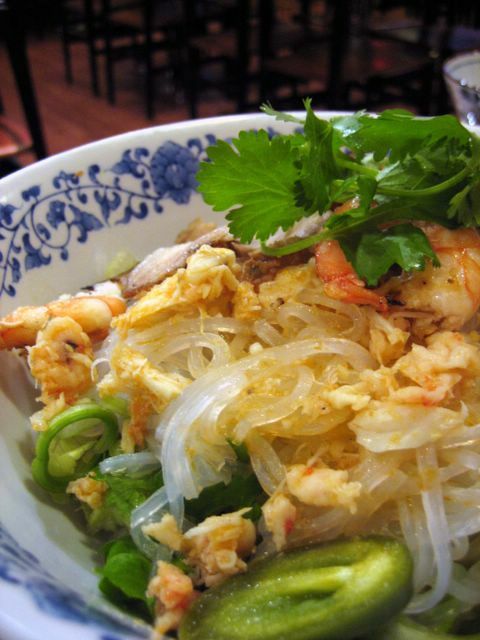 BTW, a lot of the "banh" dishes originated in Hue where they were prepared for the emperor. He would only sample a few bites of each dish bc there were tons of dishes to choose from. Hence, banh beo being served in individual dishes. But nowadays, people can make a meal out it, and that's why in the to-go places you see containers with a mound of the banh beo. Anyway, just some useless trivia. And speaking of multi-course meals, have you tried Nhu Y Fish in 8 courses in FV? Oh! And congratulations about making Best of OC! Thanks for the clarification. If you guys try Quan Hop or Quan Hy, let me know your impressions. That's fascinating! I imagined that was the deal with this type of food; small portions so that royalty can pig out on the array of dishes without filling up on any one dish. I haven't been to the 8 courses of fish, but now I'm quite interested in knowing more about it. Actually, now that I think about it, I have passed that place! I heard that Quan Hy is bigger, grander, and has a more complete menu (but no pho). I'm going to try it the next time I get a chance. 8 courses of fish is like 7 courses of beef. The 8th is Hanoi style sizzling fish with dill. So you get eggrolls, grilled for rice paper, rice soup, grilled with some kind of herb leaf, etc. I think it's around $16 for one person's portion? Meaning two small pieces of each course. I usually just get one portion to share and then order a normal dish on top of that. They also do a brisk business in whole baked catfish which can be eaten with toasted and normal rice paper. BTW, I did a review of Saigon Bistro last night. Ever been there? Wow, $16/person! That's not bad at all. I'll have to try it come Lent. Or maybe sooner! I've heard of Saigon Bistro, and even seen it, but haven't had the pleasure yet. I'm going to check out your review right after I put this post in.